Survey is closing August 20! We want to gather input from as many people in Crozet as possible, so we appreciate you sharing your opinion on topics related to Crozet. We urge you and others in your household to fill out and complete this questionnaire as soon as possible. If you received a letter inviting you to take this survey, please click here to go to the scientific sample survey webpage. The two survey’s questions are identical. It should take about 15 minutes to complete the questions in the survey. There are no right or wrong answers; what’s important is your opinion. All of your responses will be anonymous and kept confidential, only group results will be published. This survey was sponsored and developed by local citizens of the Crozet Community Association (CCA), the Downtown Crozet Initiative (DCI), and the Crozet Board of Trade (CBT), and Albemarle County staff. It is the first step of the upcoming Crozet Master Plan update/revision. It is one of several opportunities for your active participation in the decisions affecting our community in the next five and beyond. The Crozet Master Plan (CMP) is supposed to be revised every five years. That revision time should have been in 2015, however the County postponed the revision until 2018. In order to complete the revision with as little delay as possible, we are starting with a community survey now, as was done in 2009 before the 2010 Crozet Master Plan revision. OPENING OF PUBLIC SURVEY LINK WAS POSTPONED. Our invitation letters to selected households to take the Crozet Community Survey started to arrive this weekend. We mailed to a random sample of 2,000 of the 2,600 households inside the Crozet growth area, and 1,000 households adjacent to the growth area to take the Crozet Community survey, so not everyone will get an invitation letter. Responses to the survey from this scientific sample of households are now streaming in online. Unfortunately, the mailing of the invitation letters was unexpectedly delayed, so we must postpone the opening of the “public” survey to give all of you who have received a letter a chance to open and take the survey. We’ll open the link to the “public” survey on Saturday, June 17 at Noon; that link will be available to anyone who wishes to add their voice to the survey results. We appreciate your patience and understanding regarding the delay in making the public survey available. Please contact the CCA at CrozetCommunity@gmail.com if you have trouble starting the survey or have other problems or questions regarding the Crozet Community Survey. You are at this webpage because you’ve been randomly selected to share your opinion on topics related to Crozet. By using a scientifically representative sample of Crozet residents, survey results can be used to draw conclusions about the whole community’s perspective, so we ask that only you complete the questionnaire. Please complete the questionnaire as soon as possible. It should take about 15 minutes to complete the questions below. There are no right or wrong answers; what’s important is your opinion. All of your responses will be kept confidential, only group results will be published. Please have your access code that was printed in the letter you received handy. You will need to enter it to gain access to the survey. When you’re ready, click here to start the survey. Thank you in advance for your time and input. We invite others in your household to take the survey by clicking here to go to the public survey webpage. The two survey’s questions are identical, however the public survey will not be available until the weekend of June 10-11. Please contact the CCA at CrozetCommunity@gmail.com if you have trouble starting the survey or have other problems or questions. For a gift of $250 to $499, you will receive acknowledgment in the Crozet Gazette and event handbill and four passes to the celebration in the park. And, for a gift of $100 to $249, you will receive two passes to the celebration in the park, published thanks in the Crozet Gazette and the event handbill. It takes a village – won’t you help out on Saturday, July 1 for an hour? We need your help for just an hour or two on Sunday, July 1. Below is the website to sign-up to help with the Crozet Independence Day Celebration (CIDC) between 5PM to 10PM. There are a variety of tasks and time slots. Most of the time slots are only an hour – so there’s lots of ways to help and still enjoy the event. a. June meeting – RSWA-Drinking Water Infrastructure Plan for the Crozet Area. Update on the Downtown Crozet Initiative (DCI) committee, Barnes Lumber re-development, Crozet plaza, and the Neighborhood Funding Initiative. Crozet Community Advisory Committee (CCAC) meeting Wednesday, May 17 at 7:00 PM at the at the Crozet Library. Details and notices on our website. Crozet Board of Trade meeting, Monday, May 15, at 7:30 PM at Pro Re Nata Farm Brewery. Crozet Community Advisory Committee (CCAC) meeting Wednesday, May 17 at 7:00 PM at the Crozet Library. Details and notices on our website. Crozet Independence Day Celebration planning meeting, Thursday, May 18 at 7:30 PM at the Crozet Firehouse. Any and all are welcome! 4th annual Crozet Car Show on Saturday, May 20th, from 9:00AM to 1:00 PM at Claudius Crozet Park. Proceeds benefit the Crozet Park. Please contact Sam Harris with any questions, CrozetCarShow@gmail.com. It all starts with the Crozet Volunteer Fire Department (CVFD) parade at 5:00 PM at Crozet Elementary School and goes down Crozet Avenue through downtown Crozet to Claudius Crozet Park. The Parade Grand Marshal is Crozet lifetime firefighter Lewis Barnette. we hope that the Richmond Shriners’ ACCA Mini-Patrol cars are one of the many entries in the parade. If you would like to be a part of the 2017 Crozet Fireman’s parade, please submit your entry to be in the parade to ensure you are included in the lineup. Lineup will be based on a first come basis. Horses/livestock will be placed near or at the end of the parade. Lineup will begin at 4:00 P.M. at Crozet Elementary School and the parade ends at Claudius Crozet Park. Awards will be presented around 7:30 P.M. There are no pets allowed in the event and we’ll provide designated smoking areas and ask that you only smoke in those areas. If you live nearby Crozet Park, we encourage you to walk! How much would you pay for such good times? All that’s asked is a donation of $4 per person (children 12 and under free) as you enter to park to help pay for the fireworks and event expenses. The non-profit civic groups in Crozet are the ones that benefit from any money raised above the cost of the event, so please be generous. In past years, we’ve donated thousands of dollars to CVFD, and other civic groups. The event is sponsored by the Crozet Volunteer Fire Department, Crozet Community Association, Claudius Crozet Park, Crozet Lions Club, Life Journey Church, Crozet Board of Trade, and several other area churches, and citizen volunteers. And, for a gift of $100 to $249 you will receive two passes to the celebration in the park, published thanks in the Crozet Gazette and the event handbill. You can mail a check payable to: Crozet Board of Trade and send it to: DCA, P.O. Box 261, Crozet, VA 22932. Please put “CIDC donation” on the memo line. We need your help for just an hour or two on Saturday, July 1. Below is the website to sign-up to help with the Crozet Independence Day Celebration (CIDC) next Saturday, July 1, between 5PM to 10PM. There are a variety of tasks and time slots. Most of the time slots are only an hour – so there’s lots of ways to help and still enjoy the event. To sign-up, please click here. 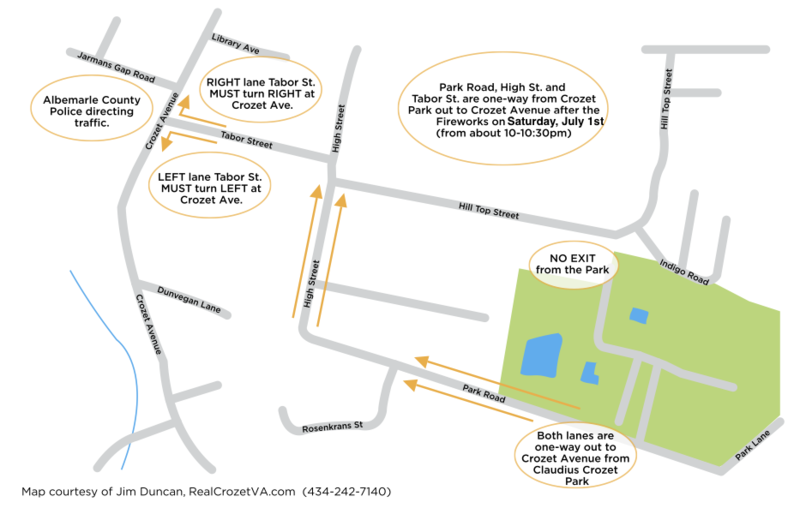 On Saturday, June 30, from about 10 to 10:30 pm (after the fireworks show) BOTH LANES of Park Road, High Street, and Tabor Street will be one‑way from Claudius Crozet Park to Crozet Avenue. Albemarle County Police officers will be directing traffic at the Crozet Avenue/Tabor Street intersection.